Campus Recreation is excited to offer a fee waiver for students interested in participating in programming at any of our centers, made possible through a partnership with Amazon. Any current and active fee paying UC Davis student can apply for a fee waiver to enroll in classes at less than the usual cost. The application period for the winter quarter is currently open. More information can be found with the Campus Recreation Fee Waiver Application. If you are interested in obtaining a fee waiver, make sure to fill out the application ASAP. It could take up to 3 weeks for your application to be reviewed. Fee waiver funds can not be used to reimburse you for a rip you have already purchased. Learn the basic skills needed for beginner level rock climbing, including belaying, basic knots, and techniques. 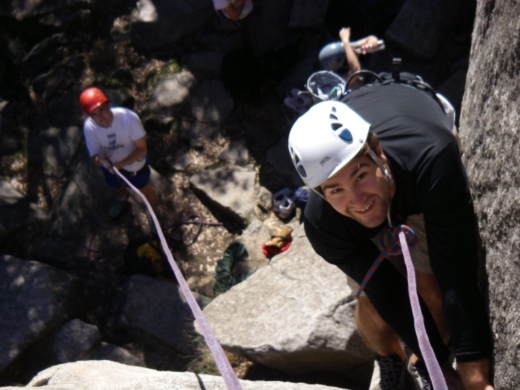 This course includes an evening session at the ARC Climbing Wall and a full day of outdoor climbing at the Cosumnes River Gorge. Climbing gear and shoes are provided. Transportation: Not provided – carpool will be set up at Pre-Trip Meeting. Pre-Trip Meeting will take place at the ARC Rock Wall the Wednesday before the trip. For more information see our Climbing FAQ sheet.